DA Form 3479-6 - also known as the "Atc Facility And Personnel Status Report" - is a Military form issued and used by the United States Department of the Army. The form - often mistakenly referred to as the DD form 3479-6 - was last revised on October 1, 2010. Download an up-to-date fillable PDF version of the DA 3479-6 below or request a copy through the chain of command. 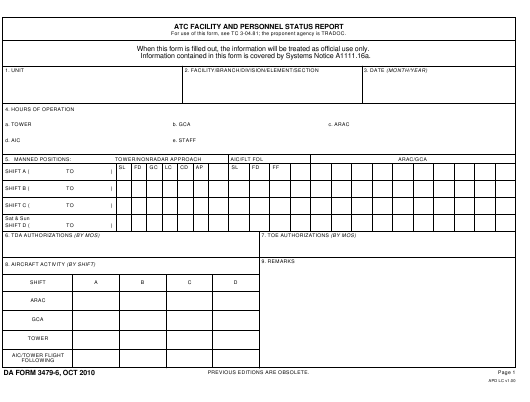 When this form is filled out, the information will be treated as official use only. Information contained in this form is covered by Systems Notice A1111.16a.